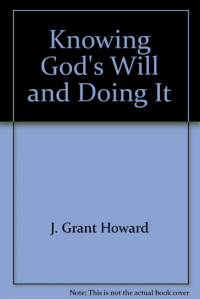 This is a 1976 Zondervan book which is a refreshing throw-back to seeking God’s will through the Scripture primarily, Christian holiness secondly (including conscience, common sense, compulsion and contentment), and outside circumstances thirdly (including counsel, circumstances, and divine appointments). It is interesting what the last 25 years have done to our thinking about God’s will. Today’s books basically reverse the above order and today’s Christians like to dwell more on subjective things.